A Frenchman who lost all his limbs in an electrocution accident has completed a swim to link five continents. Using tailor-made flippers, Philippe Croizon finished his quest by crossing between the US island of Little Diomede and Great Diomede in Russia, joining Asia and the Americas. The 44-year-old has swum three other straits since May. Reaching shore, he said the icy waters had been a challenge. 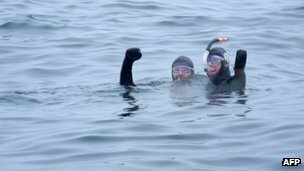 He swam the 4.3km (2.7 miles) stretch in the Bering Strait in one hour and 20 minutes, accompanied by friend and long-distance swimmer Arnaud Chassery. Mr Croizon said he hoped to be an encouragement to other disabled people. “I tell them: ‘Everything is possible, everything can be done when you have the will to go beyond yourself’. We’re all equal, disabled and non-disabled people on all continents,” he said, according to AFP. In past months he has swum between Papua New Guinea and Indonesia to link Oceania with Asia, across the shark-infested Red Sea to link Africa to Asia, and across the Strait of Gibraltar between Europe and Africa. He had the amputations after an accident on a roof in 1994, when a high-voltage power cable discharged through a metal ladder he was standing on.